I'm on a roll so far with my choices in Return of Project Horror; four movies down, and not a loser in the bunch! I do have one criticism of tonight's movie, but I honestly don't know if it was the movie's fault or Netflix's fault. I watched Cronos on instant streaming, and there was a really distracting frame rate problem, like when you're watching an online video with buffering problems. At first I thought it might be my connection speed at home, but I played a few minutes of another show just to be sure, and it looked fine. The comment board on IMDB makes it seem like I'm not the only one who noticed this. If it's the way the movie actually looks, then it's a crummy artistic choice. If it's because Netflix encoded it wrong, then I have one more reason to be disappointed in Netflix this week. You're on the bubble, Netflix. 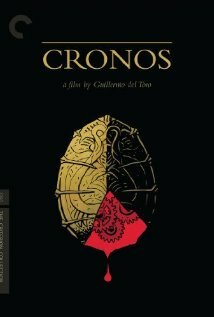 Cronos is Guillermo del Toro's first ever full-length movie. That's probably not a big deal to most folks, but it is to geeks like me. Of the four movies I've watched so far, this one took the most liberties from the traditional vampire mythology, but that also made it the most interesting one I've watched yet. The film opens with a prologue - in the 16th century, an alchemist invented a device that can give its user eternal life. Unfortunately, he is killed in a building collapse 400 years later. When his apartment is investigated, a dead body is found with all of its blood drained. Cut to an antiques shop, owned and operated by Jesus Gris. He discovers that an angel statue in his shop has a hollow base, and finds the device within, not knowing what it is. When he winds the device, which looks like a golden scarab beetle, he is surprised when it clamps to his hand and inserts a needle into his skin. He is worried at first by the injury, but soon realizes that he actually feels better and more youthful than he has in years. The wrinkles in his face are vanishing, and his vitality is returning. The only drawbacks? He is increasingly sensitive to sunlight, and he has an unexplainable thirst for blood. A wealthy, but dying, businessman is seeking the device for his own use, and sends his nephew out to buy every antique archangel statue he can find. When he obtains the statue that he knows should contain the device, and finds that it is missing, he sends his nephew after Jesus to try and retrieve it. I don't want to spoil too much of the rest of the movie, but it revolves around the lengths that the businessman will go to in order to get the device, and the lengths that Jesus will go to in order to protect both the device and his beloved granddaughter. Ron Perlman is in this. I have now seen him act in English, French, and Spanish. He's just an Esperanto film away from hitting the multilingual actor Grand Slam! The antiques dealer's name is Jesus Gris. He experiences a rebirth (Jesus), but comes out of it with gray skin ("gris" is Spanish for "gray"). Much like Let the Right One In or Let Me In, Cronos is not a vampire movie that makes vampirism the main focus. It instead focuses on the relationships of the characters in the movie, and that, ultimately, is what makes it an interesting movie to watch. I give it five golden scarabs out of five. Ron Perlman: Distracting in any language. Have you ever lost yourself in one of his performances, forgetting for just a second "Hey, look at Ron Perlman. My, that's a square jaw." I suppose I'm mostly just bitter, because Sons of Anarchy is a good show and Clay is a good character for him. But considering he joined forces with Dan Hedaya to ruin Alien Resurrection...okay, John Pierre Jeunet might have had a little to do with that too. (But not Winona, not Brad Dourif, ponytail notwithstanding, not even that little smush-faced guy who's in all Jeunet's movies.) ...I can't forgive him. I'm sure he's crushed. Does "Hellboy" count? You can't be distracted by his appearance when he's buried under 100 pounds of prosthetics. I've heard that SOA is a good show, but I didn't have FX when it started, and since I can't come in partway through, I'll just have to Netflix it one of these days. I love, love, love the Alien series, but I hate, hate, hate Resurrection so much that I'd actually forgotten he's in it. Unlike you, I mostly blame Winona. If Alien 4 was Godfather 3, she'd be the Sofia Coppola. Brad Dourif classes up every joint he shows up in, even The Wild Blue Yonder. YES! on the line about the blood. I really liked that, too, and what you pointed out with it there. Now go cleanse your palate with some Nosferatu, you purist. I'll see you back here in a day or two. I was thinking more along the lines of the Lost Boys. Well, Danny, I have to disagree with you on this one. I was not particularly geeked out by the fact that this was Guillermo del Toro's first full length feature. I was surprised to note the number of his films I've seen unawares (Mimic???) but he as a director warms no specific cockles in my heart. This may be due to the fact that by the time I finally got around to seeing Pan's Labyrinth it was so overhyped that it just couldn't live up to expectations. I also encountered the frame rate issue you mentioned which definitely added to my dissatisfaction with the film. In general, the movie just looked and felt like an overlong episode of Night Gallery. 1) Like Will, I have a very unfavorable reaction to Ron Perlman though not surprisingly for the same reason, the dismal abortion that was Alien: Resurrection. As a result I'm also not a big fan of Jean-Pierre Jeunet either, but when he used Ron Perlman in The City of Lost Children at least he had the good sense to not let him actually speak very much. A lesson he and Guillermo del Toro have not headed since (unfortunately for us the viewing audience). As regards Brad Dourif and classiness, does Child's Play count? 2) I did notice the religious overtones. Having a character named Jesus is hard to miss. However, they did lead to my favorite line of the film. When discussing the cronos device and the fact that it had certain requirements the necessity of blood arose. "Of course. You can't gain eternity from a cow or a pig." That's actually extremely sound (Christian) theology. Regardless, I was disappointed. I'm not huge fan of the vampire sub-genre, so when I watch one I like to be a little more on the nose. I give Cronos two ornate canes with a knife hidden the handle out of five. Blaming the French is always a solid option. So very intrigued by this one. I love Del Toro, and even when I don't, he captivates me. Ron Perman will always be the Beast for me, but I usually appreciate him very much. I blame the French for Alien: Resurrection! If Clay can't sleep tonight, I'm sending him back to your house! Ava, Addison, and I however will be having fro-yo filled dreams! Each time you send him back, I'm going to make him watch another movie, each more horrible than the last.